This picture of Sir Tom Finney was originally painted in acrylic on canvas, and is signed by the legend himself, Sir Tom Finney. Using the best T-Shirt printing process (Direct to Garment) we are able to reproduce this painting onto T-Shirts. This T-Shirt is available in a wide range of colours and sizes. It is exclusive to Mr Art and can only be purchased here. 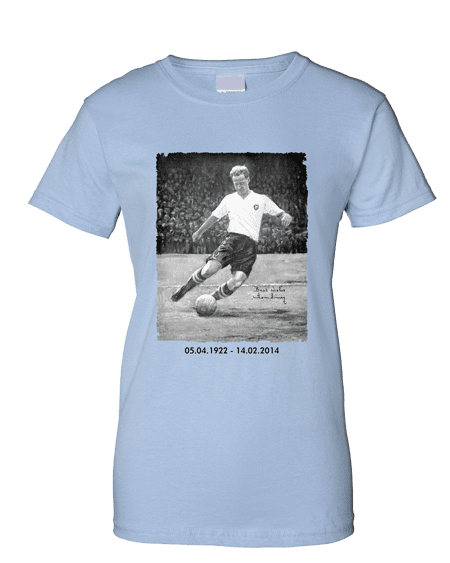 He retired from Preston North End in 1960, only when forced out with a persistent groin injury. He had played his entire career for his local club, appearing 433 times and scoring 187 goals. Sadly, Sir Tom Finney died on 14th February 2014.